This is a guest blog contributed by Jillian Rinehimer from the Dreamers // Doers network. You know it’s an exciting time to be obsessed with food when #foodie is a frequently trending hashtag. But with so many options and fly-by-night trends, it can also be difficult to navigate your eating habits. Marrying technology, travel, science, and good old fashioned recipe trial and error, these 10 founders managed to not only navigate new territory in our foodie world, but have created products and services that will change how we consume food in the years to come. As the founder of ClassPass, Biggins wanted to bring the convenience of options to the lunchtime routine. MealPal is a monthly lunch subscription service connecting you to thousands of restaurants in cities including (but not limited to) New York, Philadelphia, Boston, San Francisco, Miami, London, Sydney, and Toronto. For $119 a month (about $6 a day! ), you can use the app or website to simply choose your meal, set a preferred pick-up time and enjoy. Yao recognized the importance of teaching children how to establish healthy eating habits, yet found a lack of resources to be frustrating. So this business-savvy illustrator teamed up with Dave Resnick, a former elementary school teacher, to “redesign a broken food culture.” By combining creativity with nutrition, Planet Murple uses an interactive approach to teach kids in the kitchen using fieldtrip-like activities and hands-on recipes. What can beat an ice cold glass of milk with a fresh cookie? Silberman’s chocolate cookie cups, which allow you to experience that gooey goodness all at once. What began as an idea in 7th grade turned into a dedicated pitch years later while Silberman attended university. And thus, a sweet tooth’s dream was born. Pour milk, coffee, or your favorite cocktail, or scoop in some ice-cream to this ultimate sweet cup that also serves as your cutest party favor. Everyone appreciates a little healthy competition. This is the premise behind Govani’s marriage of technology and nutrition in her app, Foodstand. It allows you to create a goal from 20 curated challenges that address leading health qualms such as wanting to consume more organic foods or drink less alcohol. With daily reminders and guidelines, the app encourages you to build healthy habits that translate into a lifestyle. 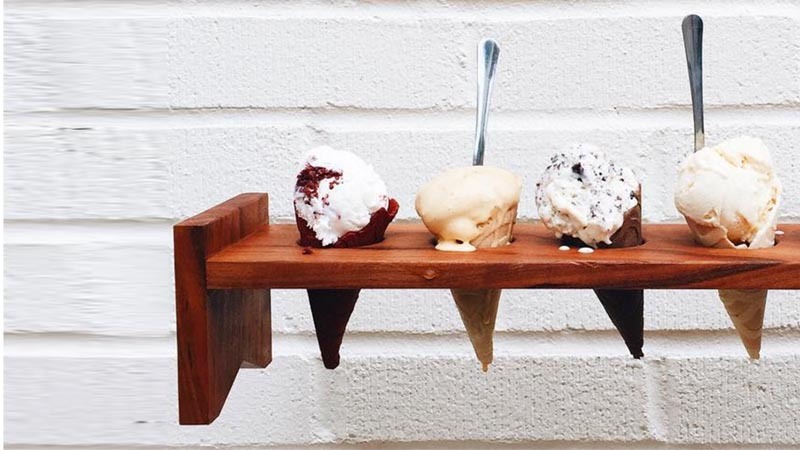 This NYC-inspired ice cream line stems from Hardeman’s personal desire for a better pint. She began whipping up flavors in her kitchen in 2009 and now, with 178 flavors to offer, Hardeman runs a subscription-based, craft ice cream delivery service to serve the NYC area. A monthly subscription gets you two specialized flavors (no repeats!) created with local, sustainable ingredients that are hand picked and packed into your pint at the Carroll Gardens factory. As gluten-free, plant-based diets became a centerpiece of modern society, Maffucci recognized that spiralized veggies could be the new pasta substitute. The inspiration stemmed from the clean diet her mother followed to manage Type 1 diabetes. Maffucci wanted to help others on their clean eating journey and, at the cusp of the zucchini noodle breakthrough in 2013, she quit her job to start Inspiralized.com. The platform uses interactive tools and spiralized recipes to inspire a basis for healthy cooking and present the benefits of clean eating. Understanding the steps necessary to improving diet and nutrition can be difficult! And, once you understand them sticking to a plan can be even harder. Tilenius created Vida Health to eliminate barriers and provide one-on-one help from a personal health coach. Through the app, you can gain virtual access to a personal trainer, nutritionist, nurse, mentor, or therapist. These experts interactively hold you accountable for improving your habits. With daily reminders, multiple consults and weekly video calls, Tilenius and Vida Health make sure you not only get on track, but stay on track. As the travel industry exploded in the past decade, Ho and Hsu saw the growing emphasis on food and restaurant trends from travelers. So, they teamed up to create an original database from trusted chefs, locals and influencers that ensure a hidden gem experience, regardless of where your travels may take you. For $25 a day, Journy’s platform creates an itinerary for you, with hard-to-get restaurant reservations included. This nut butter coffee with limited caffeine resulted from months of experimenting with caffeinated concoctions. Neumann and Raad wanted a better energy boost, not just an entire pot of coffee, or an energy drink packed with tons of crap that they couldn’t pronounce; they wanted less caffeine, and better energy. That’s where the good fats of nut butter and MCT oil came into play. The founders dissolved caffeine in these fats, which allowed for slower digestion, and therefore, a slower release of caffeine. This creates a long lasting buzz with fewer cups involved. The bottled brew also consists of MCT oil, derived from coconuts; raw carob; camu camu; and monk fruit, superfoods to not only boost and sustain your energy levels, but also to nourish you in the long term. Look out for their original nut-buttered coffee on store shelves across the city, and their brand-spanking-new nut-buttered tea. Fresh off TLC’s business, reality-show “Girl Starter,” Raman and Coder’s ThoughtFULL cookies were the talk of the competition; with “talk” as the whole premise behind their brand. The two founders wanted to initiate a snack that not only satisfies a craving, but also provokes new thoughts. So, Raman and Coder created a fortune cookie-style treat with a conversation starter in the middle meant to get the table talking. The pair came as runner up in the competition for seed round funding, putting forth a compelling cookie for the modern consumer.